On Friday morning, 46 employees were invited to the Sturm Gruppe bistro in Salching. 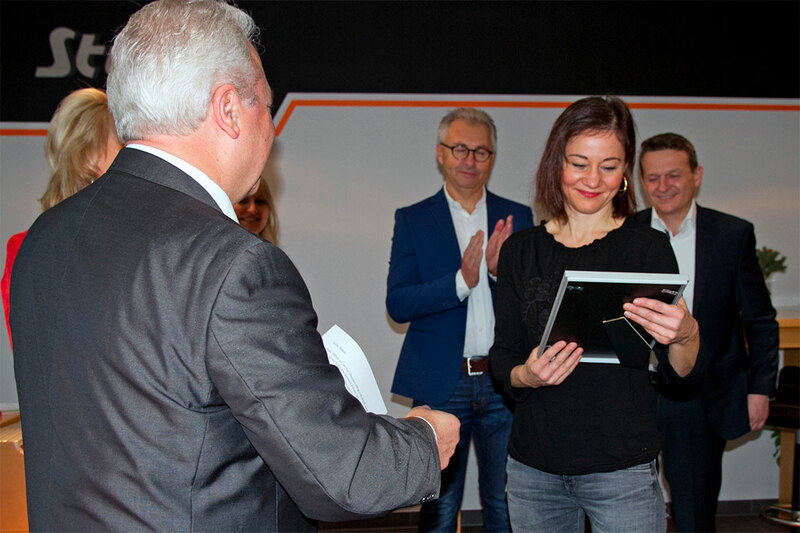 And there was good reason to celebrate – the largest employee long-service award ceremony in the history of Sturm Gruppe! “I have never been able to congratulate so many employees at once,” said Executive Manager Mr. Wilhelm Sturm. “This is due to the fact that the fourth construction phase was completed ten years ago. By building two new halls and the administration building, the production area was doubled and staff increased accordingly,” he explained. He addressed each member of staff and expressed his thanks for their loyalty over the many years with short anecdotes from their working days. As a token of his appreciation, they also received certificates. The anniversary celebrants were also warmly congratulated by the Personnel Manager Ms. Renate Zenker-Sturm, Plant Manager Mr. Arnold Hauk and Managing Director of Sturm Airport & Parcel GmbH, Mr. Thomas Gilch. Klaus Thanner and Ludwig Reichl have been working for Sturm Gruppe the longest, for 25 years! They were followed by 44 other employees who have been working for the company for ten years. After the award ceremony, the event concluded with an enjoyable Bavarian sausage breakfast.